"The soundtrack has every piece of music Chris wrote for the game, including his composition and performance of Ol' Shoshone (written by Sean Vanaman) and, when heard altogether, is a fantastic piece of work." 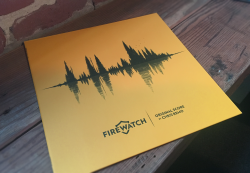 Also available with the Firewatch Soundtrack Edition on Steam. All tracks written, arranged, recorded and performed by Chris Remo. Ol' Shoshone lyrics by Sean Vanaman. Cover design by Olly Moss.